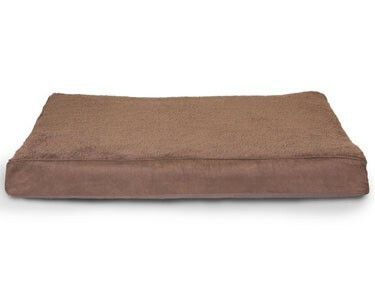 Pamper your pet with luxurious Deluxe Orthopedic Mattress Pet Beds. Designed with a deeper foam base, Deluxe Orthos provide superior support and greater comfort for all pets. This bed is stuffed with convolute (or "egg-crate") foam. Deep convolute foam features massaging "fingers" that provide support for better circulation and comfort. The laminated foam core conforms to your pet's body providing superior support of joints and pressure points. The superior support provided by both foam cores will help your pet reach a deeper, more restorative rest for you pet's good health. The low profile foam design makes it easy for pets to get comfortable. Water-resistant polycanvas base protects furniture and floors. Cover is machine washable. Foam is hand washable to keep your bed smelling clean and fresh.